The loss of a loved one is a difficult time for family & friends. During this time of mourning a thoughtful Memorial Gift Idea from GiftsForYouNow.com can help with the grieving process. A simple memorial keepsake or beautifully engraved picture frame provides a meaningful gift which reflects on the joy & happiness your loved one brought into your life. Place our Pet Memorial Stone in your beautiful garden or on the path to the front door of your home to remember your beloved four legged furry friend. This Engraved Memorial Garden Stone is made of durable resin and has a real stone look. Lightweight & waterproof, the Large Garden Accent Stone measures 11” W x 8” H x 1 ½” D, the Small Garden Accent Stone measures 5 ½” W x 4 ¼”H x 1 ¼”D, the Large Heart Accent Stone measures 8.5" and the Small Heart Accent Stone measures 5.5". These Garden Accent Stones are designed for indoor or outdoor use. The engraving is highly detailed and durable with color and texture variations. FREE Engraving is included! 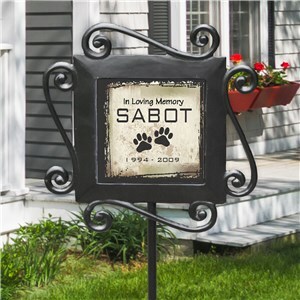 We will engrave the garden stone with any pet name and years. Give your lost loved one a special place in your garden and hold their memory near and dear to your heart when you display our In loving memory photo garden flag.Personalized with Your choice of photo, any name and Any dates, our memorial garden flag will be a lovely addition to your yard or garden.For production purpose, please enter a description that best describes the photo you are uploading. 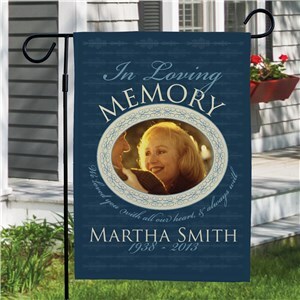 Keep your loved one's memory alive with this beautiful Personalized Hold You In My Memory Memorial Flag displayed in your yard. 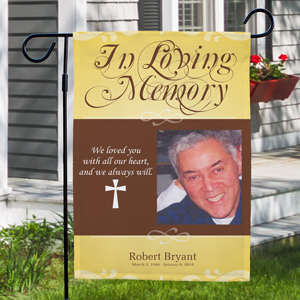 Memorial Garden Flags are custom personalized with any photo, any name and memorial date. Shop more memorial gifts today. 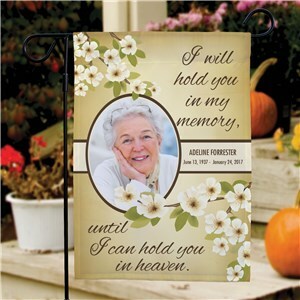 Keep the spirit of a departed loved one living forever with a beautifully Personalized Memorial Photo Flag. Upload any photo below and place this touching Flag at a grave site or in a garden as a tribute to your loved one. This design may be printed on our one sided or double sided, durable, all-weather 100% poly garden flag that measures 12 1/2"w x 18"h. You may wish to display this flag on our optional garden flag pole, door hanger or window hanger, sold separately. Free personalization is included. Personalize your Cemetery Memorial Flag with any name, dates and a photo. Please don't send any photos in the mail to us, digital photos only. Please enter description of photo. The Brief Description of Photo text area does not appear on the Photo Memorial Flag. It is strictly for production purposes. Recommended photo size is at least 500 x 500. Celebrate the life of a loved one by creating an everlasting keepsake to display anywhere you see fit. This sweet pet Pet Memorial Stones Personalized with any name and memorial date will serve as a lovely memorial to the pet you loved. Makes a thoughtful way to remember someone special! Dog memorial gifts are a heartfelt way to keep the memory of your favorite pet alive and well in your home. 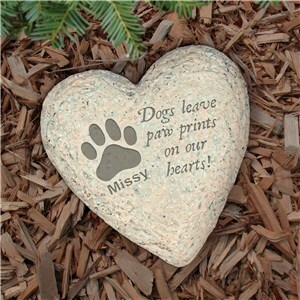 Place this touching Dog Memorial Stone in your garden or at the resting place of your beloved four legged furry friend. FREE Engraving is included! We will engrave the garden stone with any name. 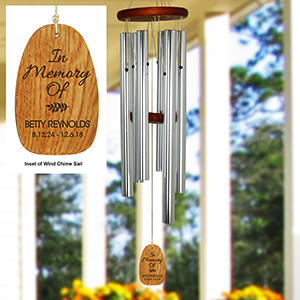 Celebrate the life of a loved one by creating an everlasting keepsake to display anywhere you see fit. 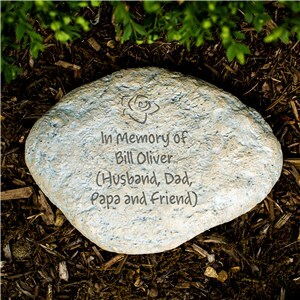 Add any four line message to this garden stone and we will skillfully engrave your thoughtful keepsake. Memorial garden stones are a thoughtful way to remember someone special. 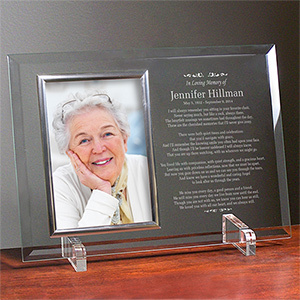 This beautifully engraved In Loving Memory Personalized Beveled Glass Picture Frame is sure to sooth the heart during this time of mourning. Personalize your in memory of gift with any name and dates. It can also be engraved with the Standard Poem (shown) or Create Your own Poem, and please choose frame trim color. Personalized Empty Bench Memorial Garden StoneWe custom personalize these Personalized Memorial Stones with any name, memorial date and 2 custom message lines. Remember someone special. 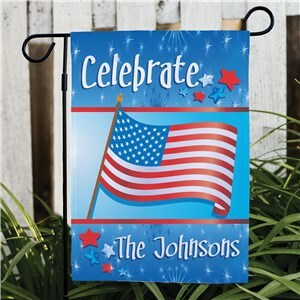 Display your family's pride in America year round with a Personalized 4th of July Celebration Garden Flag. 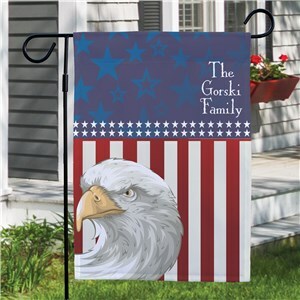 Patriotic gifts like this festive yard decoration incldue free personalization of any one line custom message, like your family name! 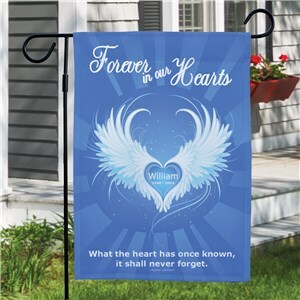 Keep your memories of your loved one close to your heart when you display this Forever In Our Hearts Sympathy Garden Flag. Personalize your flag with their name and memorial years inside the heart. You can display this flag in your garden or their final resting place at the cemetery. In a time of bereavement, remembrance of the past is the easiest way to let go. 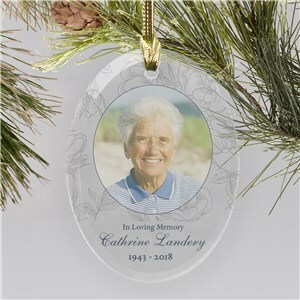 Memorialize your loved ones who have passed with our beautiful glass Personalized Floral Photo Memorial Ornaments made from your favorite photo on glass. We will custom personalize with any photo, any name and memorial years. Shop more memorial gifts and photo Christmas ornaments for friends and family today. Memorial Stone - Engraved In Loving Memory Memorial Garden StoneCreate a lovely way to pay tribute to a deceased loved one or pet in a peaceful, natural setting with our Engraved Memorial Garden Stones. Often an in memory of gift is the best way to remember a loved one who has passed on. Place this touching Memorial Stone in your garden or at the resting place of your loved one. Personalized Memorial Garden Stones are a great way to express your love, feelings and honor their memory forever.Your Engraved Memorial Garden Stone is made of durable resin and has a real stone look. Lightweight & waterproof, the Large Garden Accent Stone measures 11"� W x 8"� H x 1 -�"� D, the Small Garden Accent Stone measures 5 -�"� W x 4 -�"�H x 1 -�"�D, the Large Heart Accent Stone measures 8.5" and the Small Heart Accent Stone measures 5.5". This Garden Accent Stones are designed for indoor or outdoor use. The engraving is highly detailed and durable with color and texture variations. FREE Engraving is included! We will engrave the garden stone with any name and dates. Please enter the dates exactly how you wish them to appear on the memorial stone. Large and Small Garden Stones are sold separately. Our Personalized Memorial Wall Canvas, Personalized Memorial Frame & Personalized Memorial Ornaments are all perfect Memorial Gifts for your Friends & Family. Remember your loved ones with warm & unique Memorial Gifts.